When you’re looking for precise accent lighting or a fixture for smaller venues, the VENUE Thintri38 is your ideal solution. When combined with its larger cousin, the VENUE Thintri64, it can create spectacular side effects or extend color and light movements to every corner of the venue. 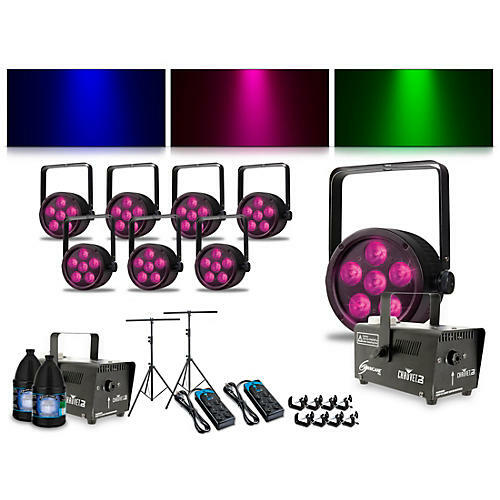 It features six 3-watt tri-color LEDs with VENUE’s LED technology that minimizes drops in brightness when the LED elements warm up over time, allowing your new fixture to retain premium performance and brightness. That means your show will look just as good at the finish as it did at the start. Includes dual-stage optics housed in a robust chassis with clear protective lens. Includes dual-stage optics housed in a robust chassis with clear protective lens. Plus, it boasts four operating modes (Stand-alone, Sound Active, DMX, and Master /Slave), seven static colors, 236 color macros, four preset color programs, strobe, dimming, and manual color mixing. The VENUE ThinTri38 is constructed with double yokes for precise aiming from stands, trusses, and floors, and includes pass-thru DMX and AC connections for neat cable management. VENUE's ThinTri38 also includes mix-and-match compatibility with their ThinTri64, TriStrip3Z, and Control16 DMX controller for complete scalability for large and small shows.